ANDERSON, Ind. – Colts rookie quarterback Andrew Luck is already an expert at the side step, the intuitive skill that can help distinguish a statuesque target from a great pocket passer. Whereas men such as Chris Chandler and Dan McGwire were punished for their lack of pocket awareness, Dan Marino was a Hall of Famer with the subtle ability to move a foot or two at just the right moment. "He does it all the time to create space to throw," Colts offensive coordinator Bruce Arians said of Luck. "Most guys feel pressure and they just run. He can move from guard to guard to create that little lane to throw it from. It's uncanny to see a rookie do it so well." The other sidestepping skill Luck seems to possess is not getting caught up in comparisons. Few quarterbacks in the history of the NFL have faced the kind of two-pronged attack of compare and contrast that Luck is about to run up against. That's why Luck, who made his preseason debut Sunday by going 10 of 16 for 188 yards, two touchdowns and three scores in the four drives he led during a 38-3 victory over St. Louis, gives thanks for being a "bad listener." On Luck's western flank in Denver is the presence of Peyton Manning, the legend he's replacing after Manning was jettisoned because of a neck injury that cost him last season and caused doubt about his future. To the east in Washington is the talented and electric Robert Griffin III, who is already a smooth-talking media darling. As the No. 2 pick, there was a strong debate about whether Griffin III should have gone first instead of Luck. If Griffin outplays Luck this season, the debate will rage. Furthermore, whereas Luck is the football version of Tim Duncan, a collection of sublime skills that destroys opponents with a thousand paper cuts, RG3 is Steve Nash, the frenetic performer who's part acrobat and part high-wire act. And if Luck needs any reminder, all he has to do is turn on a television for about 20 minutes. Between Manning and Griffin, the two seemingly have a million commercial spots. Manning has long been a premium pitch man, but Griffin already has spots with Gatorade, adidas and Subway. Luck? He had an internet spot for Nike that ran in March. "I wouldn't even call that a commercial," Luck said, laughing. Luck can't go more than a minute without his guttural chuckle rumbling to the surface, usually at the end of some self-deprecating remark. Despite being the No. 1 overall pick, Luck has preferred to take a low-profile approach on the marketing side. "It wasn't right for me at this time," said Luck, whose six incomplete passes Sunday included three drops and two throwaways. "I made my wishes known that I prefer not to get involved in anything like that right now. I realize everybody is different, so I'm not criticizing anybody for doing something like that. To me, it was just that I felt I needed to prove myself in this football circle before going out there too much other than a couple of little things." Few quarterbacks have ever had this vise grip of pressure. While Manning faced the great debate of 1998 over whether he or Ryan Leaf should have gone No. 1, that argument quickly became a farce. Manning also didn't follow a great player. Jim Harbaugh had led Indy to an AFC title game, but he was hardly a franchise quarterback. Better yet for Manning, 1990 No. 1 overall pick Jeff George, the Indianapolis native who was supposed to be the franchise centerpiece, was an abysmal failure. Manning came to the Colts when they were in the midst of desperation, not in the afterglow of more than a decade of greatness. Likewise in Washington, Griffin is stepping into a long-time void. The Redskins haven't had anyone close to a franchise quarterback since Joe Theismann took over from Sonny Jurgensen in the 1970s. 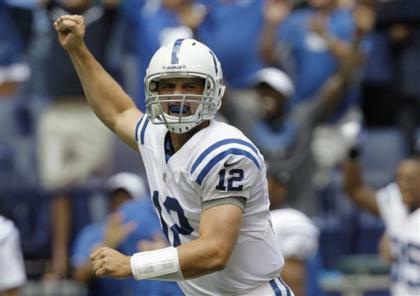 Luck, the son of a former NFL backup quarterback, gets the whole picture. "I understand, as a fan myself, why people would ask those questions [about who should have gone No. 1]," said Luck, who as a teenager used to pick the Colts when playing Madden because he was such a Manning fan. "But you have to do a couple of things. One, you try to work hard so that people aren't asking those questions. "The other thing is, I guess I'm not a good listener outside of my friends, family, teammates and coaches. It's not to disrespect anyone's opinion, but when you're in certain situations, you have to let some things go in one ear and out the other." It's sort of like learning to deal with the pressure of being in the pocket. For so many quarterbacks, the first flash of enemy color causes panic as quarterbacks start to look for open space. "You really see it a lot from the spread quarterbacks," Arians said, referring to the high number of college quarterbacks who play in spread systems. "Those guys are runners and the first thing they're thinking about is taking off when they don't see the first read." Griffin was a spread quarterback at Baylor, where he produced stunning passing numbers. By contrast, Luck played in a more traditional pro-set offense that even featured two- and three-tight end sets. Indianapolis is trying to recreate some of that two-tight end stuff with the combination of rookies Coby Fleener (a teammate of Luck's at Stanford) and Dwayne Allen, a third-round pick from Clemson who has been impressive in camp. Between those two and veteran wide receiver Reggie Wayne, the Colts figure to have an efficient short-passing attack to complement what they hope will be a decent running game (former first-round pick Donald Brown is getting a last chance to impress). "It's not exactly the same system we ran in college, but the principles are the same," Fleener said. "We want to be a running team." The Colts have to hope they can run it because the talent along the offensive line (which features Winston Justice at left tackle and journeyman Samson Satele at center) is suspect, at best. Then again, that's where Luck comes in. His ability to get rid of the ball from the tight confines of the pocket reminds Arians of some of the truly great passers, including his most recent pupil, Ben Roethlisberger in Pittsburgh. "The ability to keep your eyes downfield while you're moving around is really critical. We had a play in practice the other day where Andrew moved about this far to his right," said Arians, taking two short steps, roughly the difference between being behind the center to being behind the right tackle. "As he's moving right, he throws it back to his left, almost sidearm, and completes the pass. That's not really a play you're looking for, but he said, 'I saw the coverage and knew that if I moved this way a little, the linebacker would come with me and that guy would be open.' "
Arians shrugged his shoulders, knowing Luck was exactly right and that he had come up with something even the coach hadn't imagined. That allowed Luck to escape even a hint of Arians' famous ire. That's the kind of mechanism that figures to come in handy for quite some time.